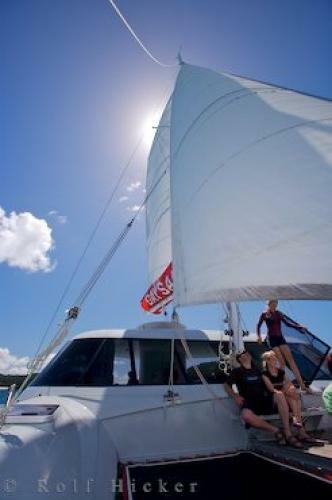 The skipper on the Carino catamaran enjoys her life style of taking passengers out in the Bay of Islands in New Zealand on a daily basis during the summer months. The skipper aboard the Carino catamaran has an extremely important job ensuring the safety of her passengers on the daily excursions around the Bay of Islands of New Zealand, but a life style she thoroughly enjoys. As she steers the Carino around the waters of the Bay of Islands, passengers can ask the knowledgeable skipper endless questions which she is more than likely able to answer.Skipper Vanessa steering the catamaran on this trip, has over 35,000 ocean miles of sailing experience, an YNZ Instructor and the family business is very involved in the events of the America's Cup with their New Zealand team. Passengers aboard the catamaran, have no fears of being on the water with this skipper and some envy the life style she leads.Skipper Vanesa steering Carino, a 50 foot catamaran sailing boat, in the Bay of Islands, Northland, East Coast, North Island, New Zealand. everyday in the Bay of Islands in New Zealand. Pictures from photo gallery "Dolphin Pictures"
This picture is part of the photo album "Dolphin Pictures" - there are more beautiful images waiting for you.